Free Video Converter is very quick and easy to use, and the output quality is decent. The downside is the watermarking in the free version; most people will be unwilling to put up with this and will feel compelled to pay to upgrade – or just look elsewhere. Fire up Free Video Converter and you'll immediately notice its incredibly simple interface. This is an indication of the fact that it's very easy to use, offering you the opportunity to convert videos in a wide range of formats. While this software is free to use, it's more of an extensive trial than a full program – there's a very strong push to get you to upgrade to the premium version. The upgrade means that there are no ads to endure, and nor are there any watermarks on the videos you convert. The fact that these are added to video created in the free version will be off-putting to some people – and it certainly rules out using the free version for anything professional – there will be others who see it as little more than a minor inconvenience. There's no faulting Free Video Converter when it comes to ease of use. 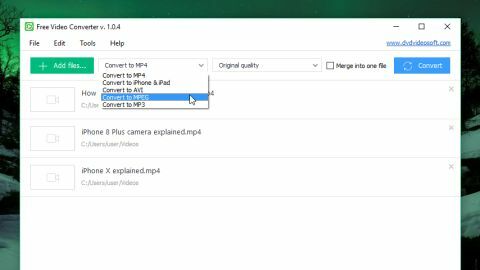 Just select the video or videos you want to convert, select the format you want to convert to from the drop-down menu, and then specify the output quality. That's all there is to it. In terms of extras, there's nothing to think about. You can queue up multiple files, but when it comes to options, the only things you can tweak are the output folder and the way output files are named. For people looking for nothing more than a basic conversion tool, this is perfect; anyone more demanding may find the simplicity frustrating.